Are you not receiving email notifications from your WordPress contact forms? If you’re looking for an easy and reliable method to ensure email deliverability, using the Postmark plugin to set up Simple Mail Transfer Protocol (SMTP) on your site is the best bet. In this post, we’ll show you how to set up WordPress SMTP with Postmark. WordPress uses the PHP mail function to send emails that are generated by a contact form plugin like WPForms. Many WordPress hosting servers are not configured to use the PHP mail function. That means that your WordPress emails, including the WPForms notifications, won’t even make into the spam folder. That’s why we recommend using SMTP to send emails from WordPress instead of using the default PHP mail function. SMTP (Simple Mail Transfer Protocol) is an industry standard way to send emails that use proper authentication method to ensure email deliverability. Oftentimes, setting up a reliable WordPress SMTP on your site requires you to go through a lot of steps. If you’re looking for a simple yet reliable SMTP method to ensure email deliverability, Postmark is the right plugin for you. Note: Postmark doesn’t allow you to use public domain emails such as Gmail and Yahoo. You can only use an email address from the domains you own (such as www.yoursite.com). To use a free email address such as Gmail or Yahoo, see our tutorial on how to set up the WP Mail SMTP plugin. Sign up for Postmark by clicking on this link. Create your new login credentials and click Create your free Postmark account. 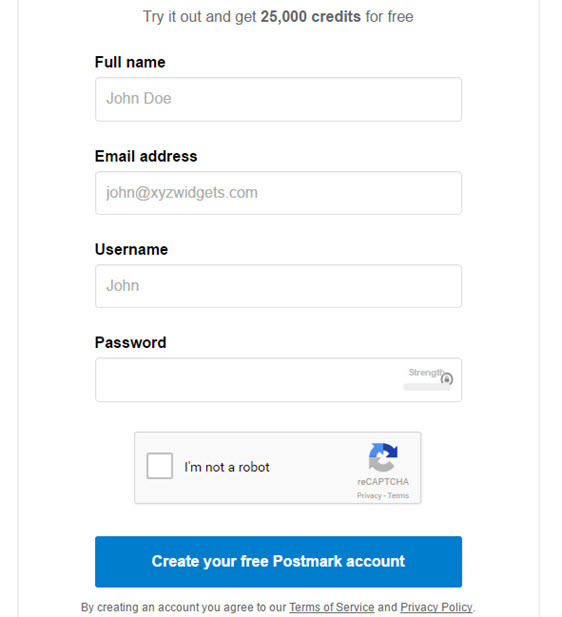 The free Postmark account will give you 25000 email credits. Now you’ll be directed to a welcome page. Click Get started » Sounds good, and then, enter any name you wish to create your first server. Now you’ll be prompted to enter your Full Name and From Email (such as yourname@yoursite.com). 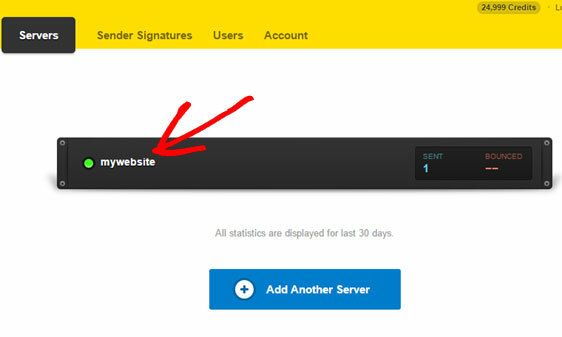 After entering the details, click Create sender signature. You’ll now be sent a verification email. 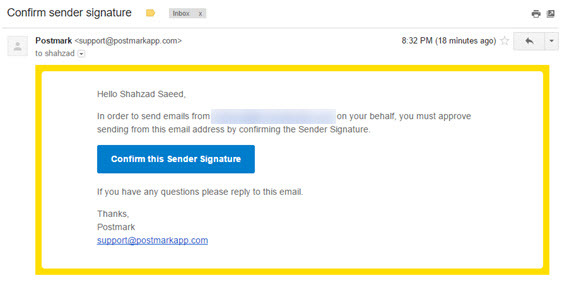 Confirm the sender signature by clicking the Confirm this Sender Signature button. After clicking the button, you’ll see a success message in a new tab. See the screenshot below. 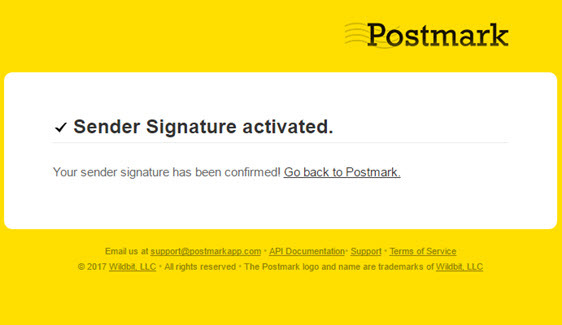 Now install the Postmark plugin and activate it on your site. Now you’ll need to configure the Postmark plugin. To do this, go to your Postmark server page by clicking on this link. Then, click on the server you just created. To view Server API, click the Credentials tab. 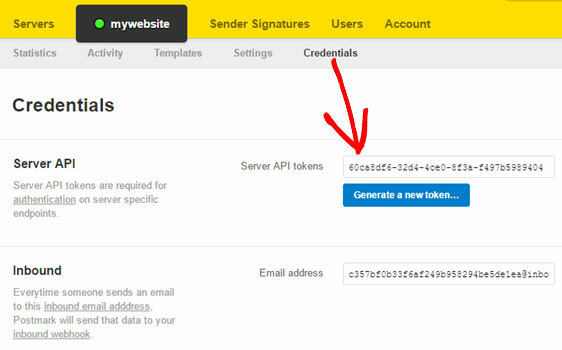 Now copy the Server API Key tokens. 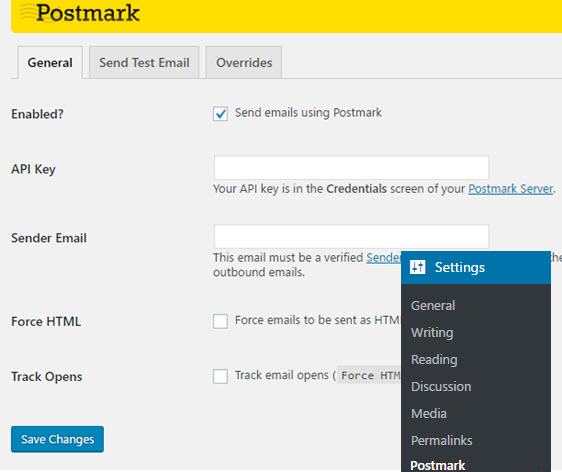 In your WordPress dashboard, navigate to Settings » Postmark. Then, click the checkbox next to Enabled? to enable sending emails using Postmark. Then, insert the API Key you copied from the Postmark site. 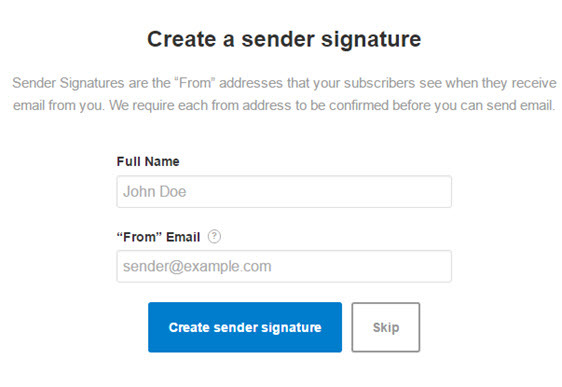 In the Sender Email field, be sure to add the verified sender signature email. Note: In WPForms, the same email should be used in the Send From setting in your form notifications. You can leave the remaining checkboxes unchecked. Then, select Save Changes. Now click the Send Test Email tab and enter your test email. 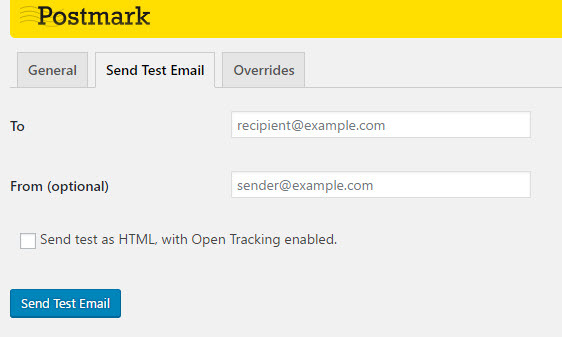 You can uncheck the box, Send test as HTML, with Open Tracking enabled and click Send Test Email to send a test email. That’s it! You’ve now successfully sent a test email and configured WordPress SMTP with Postmark on your site. There are lots of different ways to configure SMTP on your WordPress site to get the form notifications. You can take a look at a few more ways to configure SMTP on your site. I apologize, but I don’t understand your question. When you get a chance, please drop us a line in support with some extra details so we can assist.